About once a week, I get an email from a user who claims that Chess for Android makes an illegal move with the pawn or king. Invariably the user is not familiar with en-passant or castling. Therefore, I decided to post a brief summary of these rules. In the en-passant capture (click for more details), a pawn that just moved two squares can be taken by an opposing pawn as if it only moved one. 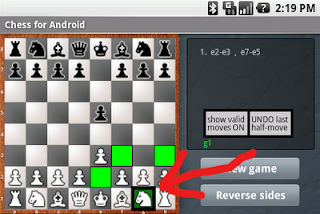 To perform this move in Chess for Android simply move the pawn as if making the capture, as illustrated below. The castling move (again, click for more details) involves the king and one of the rooks. The king moves two squares to the left or right while the rook jumps over the king to the adjacent square. The move is only allowed if neither piece has moved before, the path between the pieces is clear, and the king is not in check or crosses a square where it would be in check. 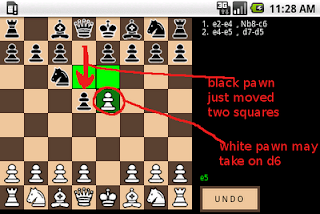 To perform castling in Chess for Android, simply move the king two squares to the left or right, as illustrated below. 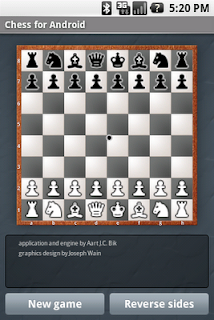 I just posted version 2.1.1 of Chess, Checkers, and Reversi for Android at the Android Market that allows starting a new game or undoing the last played human move while the computer is thinking. In the older versions, this could only happen during the human player's turn. The latest releases remove that unnecessary restriction. As before, keep in mind that each undo takes back only one half-move (ply). This means that each undo effectively switches the side-to-move. Either use "Switch Side" or make your move on the board to start the engine again. Although many users seem to like the new full screen, some users really want to see the status bar at all times. Therefore, I just released versions of all my Android games that give the choice between hiding or showing the status bar (in both cases, the screen is still used more efficiently than in the older versions). This is how a screen without status bar looks. To enable the toolbar, press the menu button and select "Options". Then de-select the "Full Screen" option to get the status bar back. 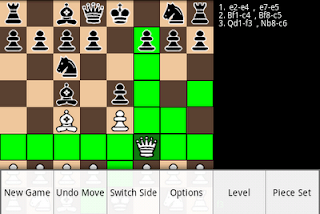 The new release of Chess for Android gives a choice in board style and chess piece sets (others may be added later). To change, press the menu button, which will give you the following screen. Then, select "Options", which will show you the following choices. To switch from a wooden board to a more classic board, de-select the "Wooden Board" button. The piece set can be changed similarly. After this, the chess board has a completely different appearance, as illustrated below. 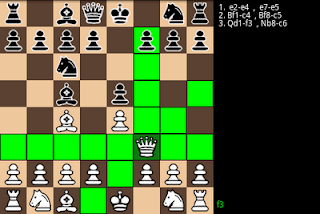 Checkers for Android supports the same choice in board styles. => Small, normal, and large screen size support. => Full screen board layout. => On screen buttons moved to menu. => More levels of strength. => Choice of two chess piece sets. 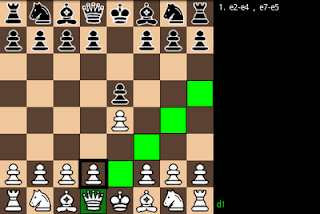 Her is a preview of the upcoming Chess for Android on a small, normal, and large screen. The full screen is used for the board layout. It also uses a new chess set, designed by my sister Elisabeth (awesome job, thanks!). Other upcoming improvements include board rotation (so that the player can see the pieces from the perspective of either white or black), a choice in chess sets, and an enhanced menu (rather than mixed on-screen and menu buttons). While preparing my applications for the wider variety of screen sizes, I also eliminated the title bar and "wooden" border in favor of a larger board size. Especially in landscape mode and for the upcoming smaller screens, this will hopefully enhance the playing experience. 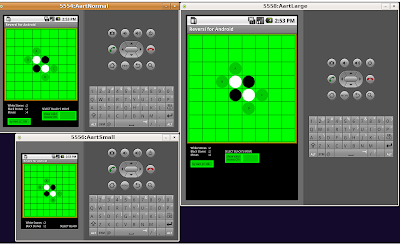 As a preview, a screenshot of Reversi for Android before and after shown below (ignore the stuff on the right for now; that is subject to change too). 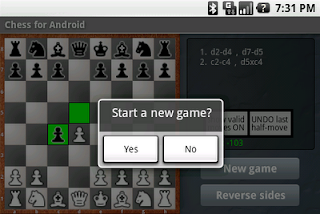 Checkers and Chess for Android will change similarly. It has been a long while since I published The Software Vectorization Handbook but occasionally I get an email on the topic. Recently someone asked me whether I could make the examples in the book available electronically. Luckily, I found all examples in my older archives, and I posted code samples on my website. Up to now, my Android applications assume a fixed screen size (HVGA 320x480) and, although portrait and landscape views are supported, the code that implements board layout is not general enough to deal with all sorts of screen sizes. Android is designed to run on a variety of devices with different screen sizes and resolutions, however, and starting with version 1.6, multiple screen sizes should be handled. Just for fun, I tested how my applications would run on various screen sizes. The screen shot for reversi is shown below. As expected, I have some work to do to make my applications more compliant with the latest extensions. This also may give me an excuse to implement some of the other requested features (such as rotating the board when playing black in chess). The chess engine bug is starting to itch again, however, so I decided to pick this up. Hopefully I can release a SMP version of BikJump soon! Leo Dijksman kindly posted a chess engine rating list on the WBEC-Ridderkerk forum, based on edition 11 to 16 of the WBEC-Ridderkerk computer chess competition. Below I show some stats for various versions of BikJump. Many thanks to Leo for providing the ongoing WBEC tournaments! With an eye on California's water shortage, we decided to do some water-efficient landscaping. With enormous help of my sister, we converted a corner of our front lawn into a mini cacti corner. In another corner, far away from playing children, we decided to put some larger, more thorny cacti. Hopefully this way we can keep the garden green with less water! This weekend a large branch of my neighbor's tree broke and fell into our garden, right on top of our swing and patio furniture. Luckily nobody was hurt, since we all just came back from church when it happened. The swing broke most of the fall and even the solar panels survived! Needless to say I spend the rest of the day cutting wood, very kindly assisted by neighbors from all sides! The last few weeks, I received many very kind emails as well as positive comments at the Android Market about my games. This has been a very nice contrast with the sometimes rough comments or emails I also get (constructive feedback is always welcome, but please study the rules of the game before you complain :-)). So I just wanted to say thank you to all that took the time to write a nice email or comment! 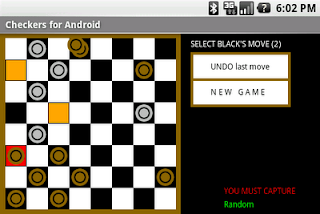 By popular request, I have changed the trackball input of Chess for Android slightly. When the trackball cursor hovers over the chessboard, it is displayed as a rectangle that moves one square at the time. When the trackball cursor leaves the chessboard, it changes into the "old-style" cursor that moves several pixels at the time. Please let me know if you like this new input mechanism better. 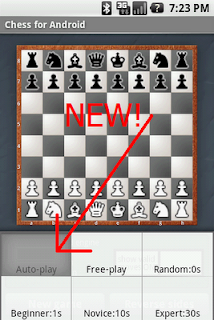 Several users requested a confirmation dialog when starting a new game in Chess for Android to avoid resetting a game in progress by accidentally hitting the new game button. Therefore, I just posted v1.5.5 at the Android Market that adds this feature, illustrated below. Although not directly requested, I have added this feature to both Checkers and Reversi for Android as well. My daughter just started to learn addition and subtraction in school. Like a true nerd, I wrote a Java applet to generate math worksheets, so that I no longer have to write out exercises by hand. To try it out, go to math worksheet generator. Click on the top-right +/- buttons to increase and decrease the level of difficulty, click on the ADD/SUBTRACT button to toggle between additions and subtractions, or click anywhere to generate new exercises. Feel free to print the math worksheets for your own use (unfortunately, this may not work for some browsers). I made minor improvements to the reversi move generator and evaluation function in version 1.5.5, hopefully resulting in stronger play. Unfortunately, in my excitement I forgot to add a new internal state to the save/restore functionality, which could introduce wrong play if a game was exited and later resumed. 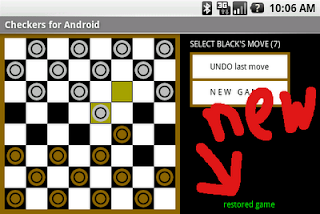 This has been fixed in version 1.6 of Reversi for Android. Many thanks to Patrick Barnes for reporting the bug (with a screen shot as illustration!). As can be seen in previous postings, the perft method is useful to verify the correctness of a move generator. The method traverses the game tree up to various, increasing depths to count all leaf nodes. The results are compared with pre-computed values to isolate bugs. Although the method originated in the chess programming community, the same debugging principle can be used for any board game with deterministic rules. So far, I have used perft to verify the move generation of Chess for Android and, thanks to Martin Fierz, also for Checkers for Android. I was unable to find pre-computed perft numbers for reversi, however. Therefore, here is what is probably the debut of perft for reversi from the initial position, hopefully useful data for aspirant reversi programmers (at depths 9 and up, "passing" moves start to occur; at depths 11 and up, higher leaf nodes in which neither player can move start to occur). I was able to make a small improvement in the checkers move generator (written in Java for the Android SDK). The following table shows run times of several perft depths before and after optimization when run on the emulator (which should mimic actual run times on the phone quite well). P.S. Runtimes for a C++ checkers move generator on a 2.2 GHz Core 2 Duo are given at my checkers page. Martin Fierz kindly extended his engine Cake with a perft feature. Luckily the numbers reported by Cake match the numbers reported by Checkers for Android exactly. Below the numbers from the start position are shown, hopefully useful data for aspirant checkers programmers. 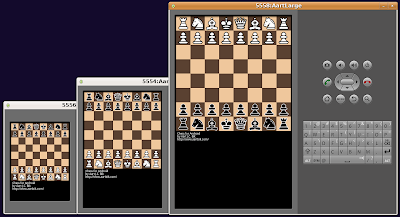 If you are looking for a checkers program for Windows, I can highly recommend Martin Fierz' CheckerBoard, consisting of a checkers GUI that features game databases, opening books, endgame databases, and various checkers engines (including the capability to plug in your own as DLL). 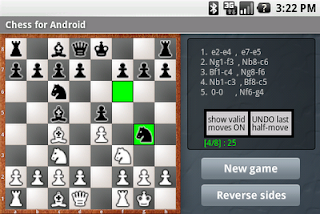 I have used his engine Cake as "sparring partner" to test the correctness and strength of Checkers for Android. Needless to say, Cake won, but the games at least assured me that my Android version plays correct checkers. Martin also kindly responded to my request for adding a perft feature to Cake, which will enable verifying the correctness of my move generator against his. I am on the roll with updates! Version 1.3.2 of Chess for Android uses a larger font for the move list and highlights the last moved played by the engine (controlled by the already existing "show valid moves" button). I am thinking about a version 2.0 with a completely new board layout to use the limited screen space more effectively. As usual, keep an eye on this blog if you are interested.